The trend of Bulgaria’s population decreasing continued again in 2016, with a fall of 0.7 per cent compared with 2015, according to figures released on April 12 by the National Statistical Institute (NSI). 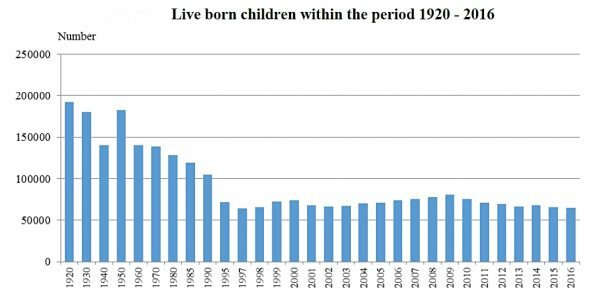 In 2016, Bulgaria had a total population of 7 101 859 people, a sum 51 925 fewer than the year before. Of the total population in 2016, 51.4 per cent were women and 48.6 per cent men. The process of population ageing also had been continuing. Close to 21 per cent of the population of Bulgaria were 65 or older, a slight increase over the figure for 2015. About one in five women in Bulgaria were over the age of 65, a proportion higher than for men, with a figure of 17.2 per cent.